New York Times best-selling author Lynsay Sands, one of paranormal romance's original superstars, delivers a scorching and delightful story of a mortal man on a mission - and the Vamp who is his only hope. Love? Paul Jones has need of a vampire, and only Jeanne Louise will do. He just has to convince this beauty of a Vamp to help him, never imagining that he would fall in love. But with the immortal world's answer to law enforcement hunting them, their time together is running out... and Paul and Jeanne Louise will need to risk everything to spend an eternity together. Yes, another great chapter in this series. What other book might you compare The Lady Is a Vamp to and why? None, this story is unique enough for me. What does Paula Christensen bring to the story that you wouldn’t experience if you just read the book? Hearing & feeling the emotions out loud. Yes, both i laughed out loud & got teary eye because i felt for the characters. Paul is wonderful and his sacrifices touches you in the heart, please listen to this story, won't be a disappoint. 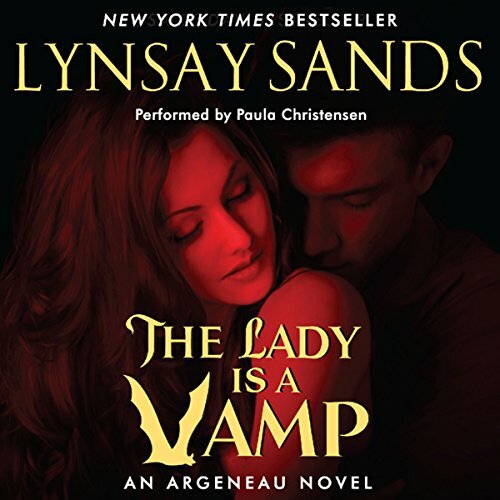 Brilliant, as you would expect for LS, this is perhaps not my favourite Argeneau romance story, but it was still a great listen. It mainly focused on Paul and Jeanne Louise's battle to turn both Paul's dying daughter and Paul before it's too late for them both. It was also good to hear what's been happening to the other characters from previous books. The only downside is that now I have to wait AGES for the next one in the series. Worth a credit? Absolutely - but, if you haven't listened to the rest of the series then do yourself a favor and start at book 1 then work upwards. I was over the moon when I saw this pop up on the audio list and even more so once I started listening to it. I have the entire series and often listen to my favourites again and again. I would recommend you start this series from the first Novel, although, having said that, I didn't. For some reason I listened to them out of order, and instead in the order of my interest. I soon discovered I love them all so I should have started from the first, this way you get to know the loveable characters and Argeneau family as you go. So... if you like Romance with a dash of fantasy, if you enjoy a good laugh more often than not, if you appreciate a steamy love scene that gets you a little heated, if you crave a wee bit of drama and suspense... Gee I could keep going but why read this when you could be listening to this entertaining, addictive series? Do yourself a favour and use your credit to purchase 'A Quick Bite' the first novel and before you know it you will be through the series listening to this last one on audio, hanging for the next. No one, or atleast they will wish they hadn't if they did purchase it. Ms. Christensen did a horrific job narrating this book - she read without any kind of emotion at all. She read in spurts - one line, stop. One line, stop. Again, no emotion or flow at all. Her attempt trying to create other voices for the other characters was even worse. Why didn't Ms. McGee read this story? Total disappointment! If the narrator wasn't bad enough, the plot for this story was even worse. Jeanne Louise (JL) gets kidnapped. JL doesn't even try to escape; in fact, she just goes a long with the whole thing. All for the chance the kidnapper is her life mate and for the life of the kidnapper's daughter? Okay, saving a little girl is a great thing, but does it take 9 hours and 45 minutes to do that? There is only so many times you can struggle with the - if I turn the girl, then I lose the chance at my life mate. JL repeats that over and over again until she figures out to change the kidnapper first, and then have him change the little girl. Again, doesn't take 9 hours and 45 minutes to come up with that. The story line dragged horribly; there was no adventure at all - no distress, other than trying to elude JL's family. Which by the way, the family should have found them much earlier then they did with all of their training, abilities and technological capabilities. They've found/caught other characters much quicker in other stories, but for some reason, just didn't seem capable this time? I hope Ms. Sands isn't just trying to pump out a book without really trying to develop the story first. Will there be ( or should I say, should there be) a next book in this series? It looks like Ms. Sands has run out of ideas based on the gripping story line this book had (lots of saracasim here). Don't get me wrong, I've truly enjoyed her other stories in this series. If her next story is as boring as this, I probably won't purchase anymore of her work. One more chance....mix it up! There needs to be adventure, intrigue, struggles, despair, hope, some comedic flubs along the way, hot interludes and a different narrator! What disappointed you about The Lady Is a Vamp? Would you ever listen to anything by Lynsay Sands again? Most of the characters have dreadful British or wheezing, "I am at death's door" accents. The child sounds like a mouse high on crack. The narration does not brighten the mood or experience. If you could play editor, what scene or scenes would you have cut from The Lady Is a Vamp? This is the most disappointing and unsatisfying (and last) of all Lynsay Sand's novels I have read/heard. Her novels have progressively lost their zest. I keep buying them and hoping the original exhilaration will return but alas no, this one is the worst. The most interesting character is the dog. The intriguing, multifaceted characters of the previous novels appear as poor imitations, the main characters of this novel are dull and flat. The plot is unerring in its intention to drive the reader/listener to commit ritual suicide. The dreadful narration adds to the depression. I just finished this book, and it is another great book from Lynsay Sands. It is definitely a good audiobook but if you didn't read the rest of the books in the series I would recommend that you start from the beginning. I enjoyed this book. Jean-Louise and Paul are a good match. Paul's daughter Livvy adds to the story. I would have given this 5 stars except for the narrator. She made a reasonably good attempt at using different voices for different characters but like other narrators in the series, obviously paid no attention to the minor characters' background. She mispronounced Lucien's and Caro's names, giving Lucien and Caro awful accents. That said, this book is well worth a credit!! Laynsay Sands just seems to get better with time. Very skilled at tugging heart strings. A well rounded tale. Jeanne Louise is in this book quite and unusal Argenaux. She is grabbed by a hunk of a man Paul, who is devoted to his daughter. Both Jeannie and Paul ride a roller coaster of emotions. Livy is Paul's terminally ill daughter. Whilst Paul wants Jeannie to turn Livy, and save her life, he falls head over heals for Jeannie and finds he wants to spend his life with her as well. They get there in the end, and Paul decides he wants to be Jeannies Life Mate, she will turn him, and Paul will turn Livy.... but noooo.... clumsey Bricker steps in and everything goes to rat poo in an instant. If the reader has followed Argeneax family and the individuals will find they are all there supporting Jeannie but to Pauls surprise supporting him, because Jeannie used her only turn and now faces seeing Paul remain mortal and her losing him. Just when you think that Jeannie is the unlucky one of the Argeneaux family, the plot takes a twist for the better. Nice read. Again for people with dyslexia issues, Aubilble is a godsend.